Blog posts like this make it pretty easy to do what I do. 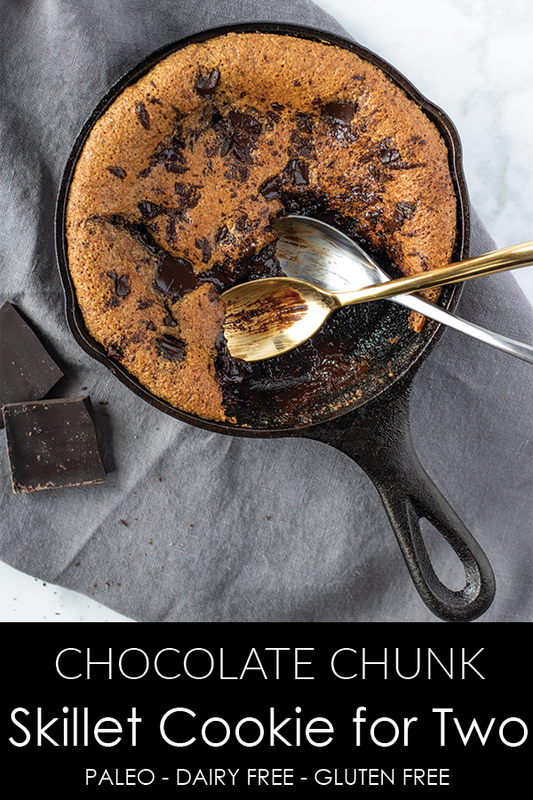 Bake, photograph, eat, edit, and talk about a chocolate chunk skillet cookie?! Yes. A million times yes. 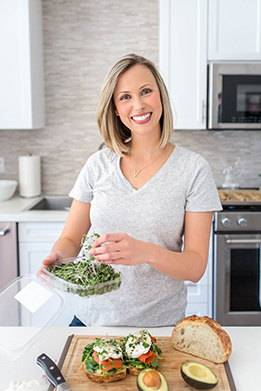 I didn’t even mention the fact that this recipe is PALEO! You read that right folks. This paleo chocolate chunk skillet cookie is perfectly proportioned for two (ie share it with your Valentine on Wednesday…maybe?) or to enjoy on your own, if you’re feeling ambitious. I found this small Lodge cast iron skillet, and skillet cookies are its only responsibility in my kitchen. It is the perfect size, and let’s be honest, there is nothing like a hot gooey cookie straight from the oven. The cookie base has a slightly nutty flavor thanks to the use of almond flour, and the coconut sugar makes it perfectly sweet. I have actually started using coconut sugar more and more in recipes because it resembles the caramel flavor of brown sugar without being cloying. Let’s talk about fat for a second. I tested this recipe with both refined coconut oil and ghee. Ghee is considered a great addition to the paleo diet. The milk solids have been removed, so it qualifies as lactose free, and still lends that rich, “baked with butter,” taste. With that said, if you want to keep this completely dairy free, you can use coconut oil. Even better, companies are now making paleo chocolate! Cue the hallelujah chorus! Paleo chocolate is dairy free, and sweetened naturally making it a healthy sweet treat when the cravings or skillet cookies strike! 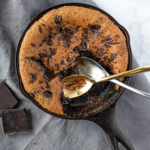 I love the paleo chocolate bars from Thrive Market, but if you have any trouble finding paleo approved chocolate for this chocolate chunk skillet cookie, send me a message and I’ll help you track it down! 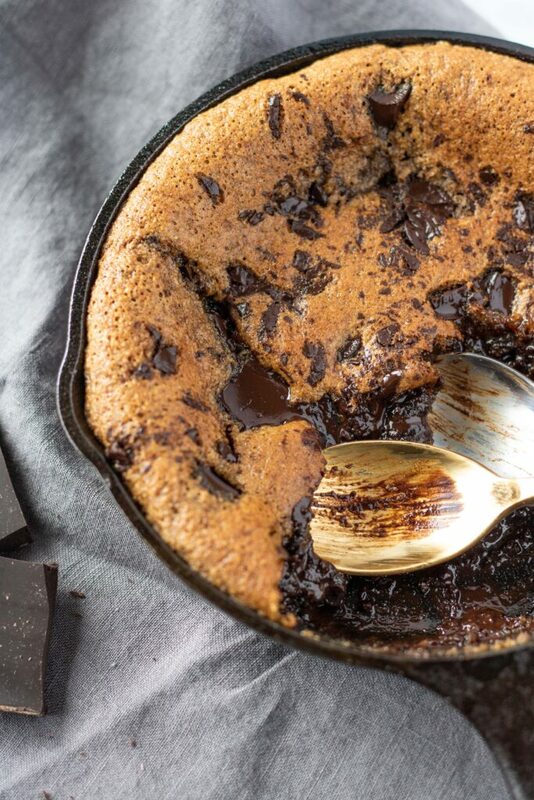 A decadent treat for two, you would never guess this chocolate chunk skillet cookie is paleo! In a medium bowl, combine the almond flour, baking soda, and salt. Set aside. In a small bowl, whisk together the coconut sugar, ghee (or coconut oil), egg, and vanilla. Add the wet ingredients into the dry, and whisk/stir until combined. Stir in the chocolate chunks. Press the cookie dough into a small, 6in oven-proof skillet. Add additional chocolate chunks on top, if desired (which is always!). Bake skillet cookie for 12 – 15 minutes, or until desired doneness. Coconut oil is a semi-solid at room temperature. When using in baking, make sure to always melt coconut oil first, then measure. I usually eyeball an amount into a small container and melt in few second increments in the microwave. This prevents heating and reheating your entire jar.